Is there really such a thing? A natural ingredient that does it all? Turmeric comes close. It can help with so many health conditions including brain health, digestive problems (such as stomach ulcers, constipation and irritable bowel syndrome), liver health, heart disease, infections, high cholesterol, arthritis symptoms, general joint pain… and the list goes on. Inflammation is the main underlying factor present in just about every chronic health condition, despite the varying symptoms of each experience. 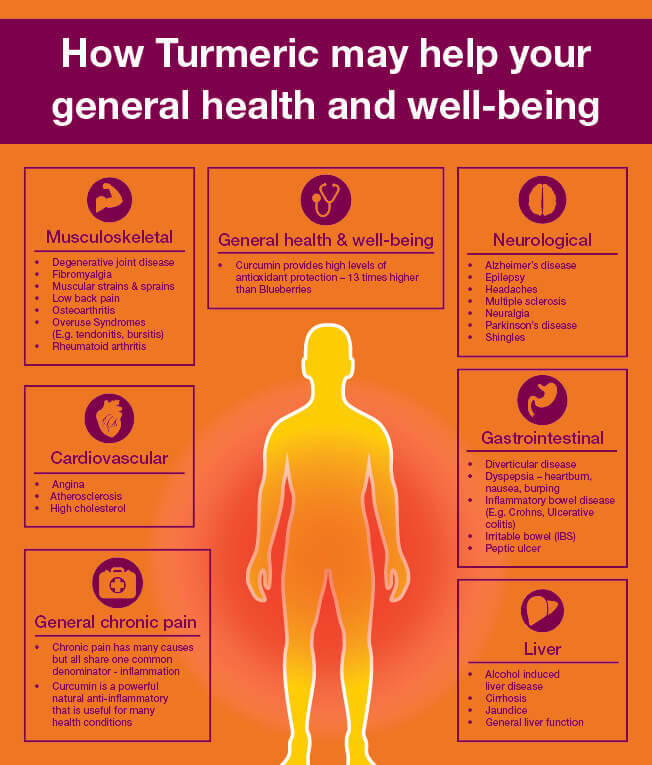 Turmeric has a range of health benefits because it contains active compounds with powerful medicinal properties. These compounds are called curcuminoids, the most important of which is curcumin. Curcumin has a powerful, natural anti-inflammatory action and is also a strong antioxidant. Turmeric can help in so many ways, but it’s important to remember that not all turmeric is created equal. The curcumin content of the turmeric found in your spice rack is not high enough (around 3-5%). You need to ensure you’re using the best quality, which is found in good quality supplements that contain around 95-98% curcuminoids. Curcumin is also poorly absorbed into the bloodstream so look for a turmeric supplement that contains BioPiperine, a natural substance that enhances the absorption of curcumin by 2000%.